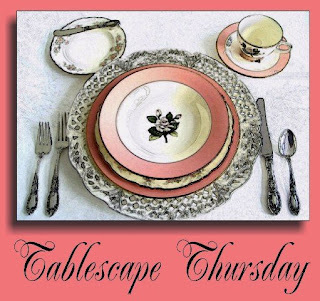 It's time for Tablescape Thursday with our hostess, Susan at Between Naps on the Porch! Please visit her beautiful blog to see her gorgeous tablescapes! I'm nervous and excited to be participating for the very first time. Susan has been my muse, my guiding light, and an absolute angel on my shoulder as I've muddled through my first week of blogging. She's been extremely kind and generous. The tabletop/decor community is fortunate indeed to have such a wonderful and talented lady doing so much for so many. My first effort starts with a casual arrangement of flowers from the garden. I took a brief stroll with basket and shears in hand, snipping a few of whatever I noticed blooming. There was no master plan, just 3 of lots of different things and, sometimes, one of a color that caught my eye. The greenery included hosta leaves, various fern fronds, and a handful of zebra grass. Definitely an affordable centerpiece! "Sentimental" in the title refers to the fact that these were my late mother's dishes. I never knew what kind they were until recently. They are unmarked except for some numbers on the underside of the vegetable bowl. The number corresponded to "Jean," a Homer Laughlin pattern introduced in 1944. My father gave them to her in the 1960's. They were a bank premium for opening a new account. He worked there, and one of the perks was that he could buy additional place settings and serving pieces. The candelabra are silverplated (and could use polishing -- sorry). Sterling would be nice, but I hope the guests won't turn them upside down to determine if they're "real" or not -- especially not with the candles burning!!! This pair was on sale for $35 at a local antique mall. The flatware was my mother's as well. She normally didn't care to indulge herself with things she considered luxuries. She was into recycling when recycling wasn't cool! She'd always wanted a set of 1847 Rogers Brothers flatware. She saved a few dollars here and there in the cookie jar. I remember going to the jewelry store with her (as a child) and "helping" her pick it out. The pattern is "Remembrance." I now know that it was Rogers Bros. 100th anniversary pattern, released in 1948. It became very popular and is considered collectible today. The water glasses are "Marquis" by Towle. I've used them as wine glasses before (nice and big), and I suppose they could serve as iced tea glasses as well. I'm not a huge fan of floral patterns for dishes, but I think this one is pretty and subtle. When my father offered me the china, it brought back many wonderful memories of beautifully-prepared, delicious family holiday dinners. It had been stored unused for years in a cabinet above the refrigerator. Below: My first silver -- a fork and spoon in Rogers Brothers Daffodil pattern. My great uncle and aunt owned a jewelry store. They "shopped" for my gift there and shipped it to Texas where my dad was in the Army (and where I was born while he was out on maneuvers). The berry spoon was another bank premium. Looking out into the entry hall. Looking up at the dome above the chandelier. Another view of the center of the table. View through the goblet. The cotton lace placemats and napkins were purchased at a recent estate sale. It was the second day (when prices are reduced) so the "smalls" and linens were half price. I think this set (for 8) was $4. I know it's a faux pas to burn candles in the daytime (or to burn scented candles during dinner), but this is make believe, right? All about ambience? The rug under the table was definitely affordable. It was only $99 at a local charity thrift shop. The label said "perfect condition." I unrolled it, looked at the back and front, sniffed it -- you name it -- it WAS perfect. It's 100% wool, handmade in India. Perhaps not the colors I would have gone looking for, but it softens and warms the room. I like it -- what do you think? A glimpse of the window treatments (came with the house). One of the semi-abstract landscapes I painted in watercolor is on the wall. Ready for guests -- what should I serve? Recycled roses: The lovely neighbor on the corner provided dinner. I took roses. She returned them the next day, because she was going out of town and wanted them to be enjoyed. They dried in the vase, and I decided I like the effect. They look rather like aged crepe paper, don't they? Dusk arrives, and the candles glow more brightly. Looking into the sitting room. One last look; hope you enjoyed stopping by to see a Sentimental Setting. Welcome to Blog World! You have set a beautiful Tablescape filled with so many fine details. How wonderful you have your mother’s china as a keepsake. I have done a few Tablescape Thursdays and love the event. It is a great group of bloggers and Susan is a most gracious hostess. Love your blog name, it is a good one! You don't have an e-mail for your site so I am writing you here. When you visited did you see 3 columns across my blog? I had someone just write and tell me my third column has dropped to the bottom so I am trying to figure out what is going on. If you have time please let me know. You can leave a comment on my first post and I will see it. Also I added your site to my blog roll. What a sweet tablesetting. I have my mother's china and silver as well. I wouldn't take anything for it. Love your dining room! Hello Bill, I have just been enjoying your blog and your first tablescape, your dishes and whole setting here is elegant and beautiful, welcome to blog-land, Kathy. Hi Bill, your table is refined and elegant...a joy to behold. The centerpiece is truly stunning! Oh, Bill! Welcome to Tablescape Thursday! I tell we're going to love having you here! Your table is just gorgeous! How wonderful you have your mother's beautiful china! What sweet memories! Your floral centerpiece is so pretty! So you're a gardener too? ;) You paint also? Oh, my. I love your rug and what a bargain. Now you know you're teasing us by showing little glimpses of your other rooms. You'll have to post a home tour soon! We'll all come! Your mother's dishes are fantastic! I love the idea of the bank premium dishes; it's too bad those kinds of promotions don't still exist today. I remember that my mother participated in a similar program at a local store when I was a child for bathroom towel sets. The flatware is wonderful...I'm glad you took the china when your father offered. These photos are forever! Your room is such a wonderful setting for this lovely tablescape. I love the elegance of it. I'm glad to meet a fellow thrifter that uses the smell test! :0) The flowers are just the right centerpiece for the addition of color!! wow I love your mothers dishes, it all looks beautiful...and wowza to that chandelier! I think you should get A+ for your 1st effort, you've handled it like a pro. . .You are lucky to have such beautiful dishes and accessories to work with. I will be looking forward to seeing more from you, I bet you'll get an award before long too! Cheers and have a great week. . .
Bill- You are a natural! Congratulations on your first TT and on your mom's china. I don't think banks do that anymore :)Hope you'll take us on a tour of the garden soon. I clicked your "follow" and I'll be back! Wow, this is just gorgeous! I love it all ... the china, the chandelier, the silver, the crystal stemware, the placemats ... Fantastic job! Love your Sentimental tablescape! Love all the detail...I have my mothers dishes too, I can't bear to bring them out yet! The glimpses of your home look beautiful too! You can set one gorgeous table! Those lace place mats are heavenly and your mother's china is just beautiful. I'm glad you're getting to use it. What a lovely tablescape, and so special since the china was your mother's. Your did a great job! P.S. - I like those dried roses too! Bill, you did an absolutely wonderful job with your tablescape! BRAVO! I enjoyed seeing all of your lovely things and hearing the stories behind them. That made this a very special post. Welcome to blogging, and I hope you will come by and visit me, too. I love company! Oh, and you really got some good deals on the things you mentioned thrifting. Great job! What a beautiful tablescape - thank you for sharing all the wonderful memories and stories of the dishes and silver. What a lovely floral arrangement too. This is all very beautiful. First of all I want to say welcome Bill! Second I covet your silver candle holders! Just beautiful tablescape! Awesome post! Pretty flowers too! Bill, Welcome to Blogland! Your table setting has left me almost speechless, well almost! I love the sentimental stories behind the all the pieces. That makes them all priceless! Happy 4th of July! Your table is stunning. I love having family and memory pieces. Those candlesticks are fantastic! Happy 4th of July!! Hi, Bill..I'm bj and it's so nice to meet you. Welcome to a world you are gonna just love. Your memory dishes and flatware are to die for. I love them so much. The rug..oh, my...it is just perfect with your table. I kept breaking my neck trying to peek into your other rooms. I do hope there is a tour in store at some point. Have a blessed and happy 4th..
What a great presentation! I especially like your floral combination. Just the perfect POP of color with your very sweet and neautral dish tablescape. The candlesticks are to die for. Bill, this is very elegant! I have yet to get my first silver. I was not into all this stuff when I was young. The story about your father working at the bank and getting these things for your mother warmed my heart! I don't know much about faux pas; just that I probably commit many of them and am completely unaware! Please come back to our Thursdays. So nice to have a man who enjoys beautiful details. And is an artist as well! Adding you to my blog roll. Have a splendid holiday weekend! Your dishes are stunning and what a treasure to have and USE your mom's set. It is especially great to know that they came from your dad. Your table is very elegant looking. Hi Bill - I just loved your tablescape! Your mother's china is beautiful. Very special to you for sure! I enjoyed the gorgeous floral centerpiece! Overall your dining room is just lovely from carpet to chandlier! Huggy Hugs!! Finally getting a moment to come back and tell you how much I love Dixie Carter. Your post below is great. Designing Women was one of my all time favorite shows. And, welcome to blogging....hope you enjoy it. Beautiful! Lucky you to have such lovely pieces, and the sentiment and memories they hold are priceless. To me, the flowers make it all come alive! So much prettier than a grocery store bouquet. When can I come for dinner????!! How precious using your mama's china! The table is beautiful! !